The material for church services includes part of a collection of gospel readings for Sundays and feasts from Christmas to Palm Sunday. On this page, the reading for Christmas Day is given. It is from Matthew 1:1-18, the genealogy of Christ. This was a special text which was sung rather than simply read. 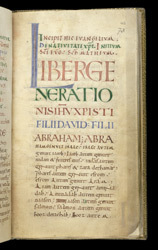 Some of the oldest musical notations which survive (9th century) were written for the genealogy in Matthew, although none is given here.